Charlie has been reading the Harry Potter books lately, and like almost every child that does that, he has become slightly obsessed with them. I was not particularly surprised, then, when he asked for a Harry Potter birthday party! Unlike Max’s Ninjago party, a I think a Harry Potter party needs to be BIG and MAGICAL…and involves almost disgusting amounts of candy. I tried to find the simplest and least expensive ways to put together a party that we would all remember. 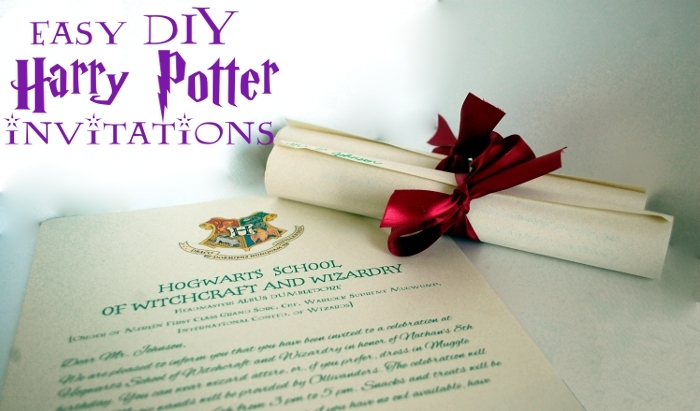 So to get started, here’s how we made simple Harry Potter party invitations. 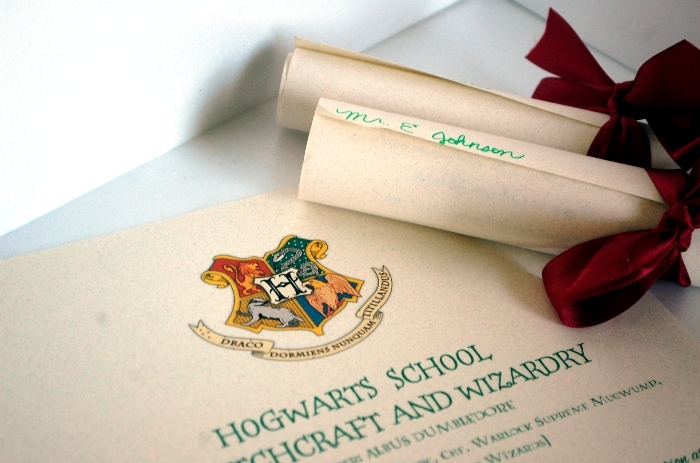 I looked around and obviously, the most popular way to go is to send a Hogwarts letter to the children you’re inviting. Charlie wanted to make paper owls and attach them to each invitation, then throw them at his friends so it would be like it was being delivered by an actual owl, but we (by which, I mean ‘I’) decided against that idea. Instead, inspired by invitations here, I decided to go for a simple roll of ‘parchment’ tied with a lustrous burgundy ribbon. I adapted the invitation text from this website to suit our needs, and just printed them out. After we rolled them up (we rolled them around a broomstick to get a good curl) and tied them up, we labelled the outside of each scroll with a green marker to make sure we didn’t get them mixed up, since each letter is customized with a child’s name. I got a picture of the crest from Wikipedia, used this font for the header, and this font for the script. (They’re both free, because that’s how I roll.) I made the letters green, because that’s in the books! I had to buy the paper for the invitations (thick, creamy paper, about $5) and the roll of ribbon (about $1.50) so I spent out of pocket between 6 and 7 dollars for the invitations, but I only used a few pieces of paper for them AND I have ribbon left over, so I probably used less than $2 of materials for them! Stay tuned for more Harry Potter craziness, coming right up. This entry was posted in Life in General, Make it in Minutes, Other Projects.